All available scores for Road To Heaven are in the section below. This piece of music was composed by Five For Fighting. 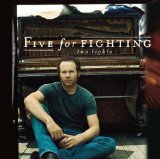 If you would like to leave a review of the Five For Fighting sheet music on this page, then please click on the tab "Comments". Would you like to share this track with your friends? Then just click on the share button on this page, and you can tell your friends an family about this awesome track. We currently offer 1 arrangement of Road To Heaven for 4 instruments.